Granddaughter of iconic Australian artist, Pro Hart and daughter of David Hart, Chloe is now making her own mark as a professional artist. Born in 1994, Chloe sold her first painting at the age of 11. Every year since, she has produced very limited works, all of which have been snapped up by savvy investors. 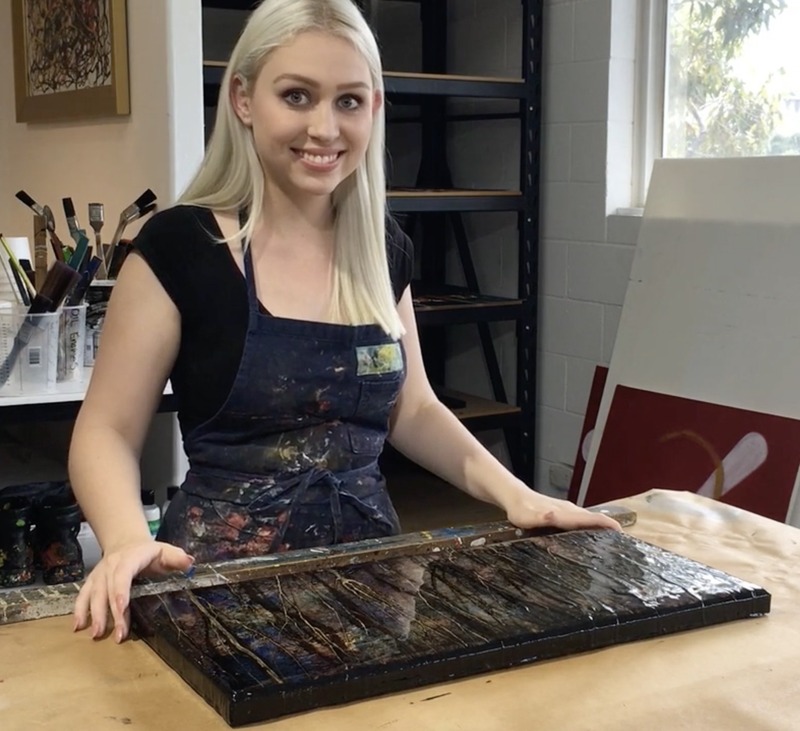 Being a part of the Hart dynasty and having the Harts’ artistic genes passed down to her, Chloe has naturally explored a number of techniques and in her teenage years she focused on a range of ‘abstract action paintings’. The non-representational, unique form of Chloe’s abstract art makes it a popular choice for art buyers. They are full of colour and energy and show a distinct style of her own. It was these paintings which created high media interest when exhibited in Generation Next, a showcase of three generations of Harts – Pro, David and Chloe. In 2009 Chloe was featured in a full-page article in Women’s day and in 2010 she was featured on a children’s television programme called “The Shack” which was telecast to over 15 countries. Chloe featured in the “Girlfriend” magazine in 2011 as part of their “Role Model Series”. The article discussed her inspiration and her focus on achieving her goals. Chloe was asked to be an Ambassador for Read2Remember, an initiative of SunnyKids, developed to help our younger generations understand the importance of Remembrance Day in a positive way. Chloe’s early 20’s saw a new style emerge with her love and appreciation of trees becoming evident in every piece. She also puts her hand to painting modern pieces of sculpture. Over the years Chloe has received huge media interest and has been included in many stories Australia wide. Chloe completed a university degree in creative writing in 2015 and is currently studying her Masters and then will do her Honours to become a Professor. She hopes to one day write a “best seller” and teach at a University. Art will always be in her blood and her natural ability to create artworks and to write will see both careers flourish. Chloe has a huge future ahead of her as a generational artist.